We visited our daughter and son-in-law last week in Washington. It was easy to fall in love with the beauty and awesome temperatures in the Pacific Northwest. 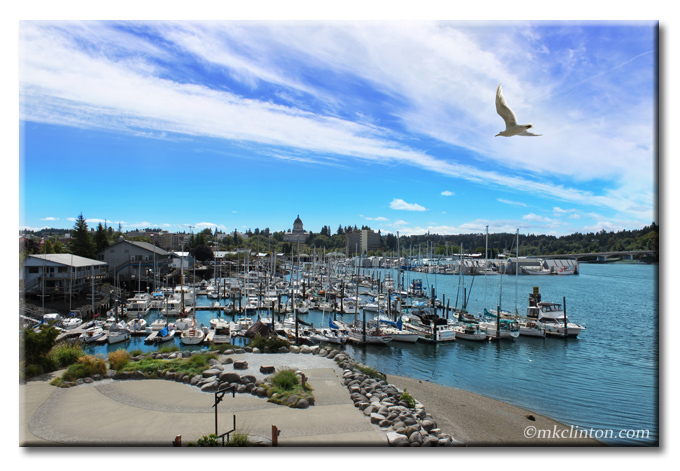 We enjoyed a trip through Olympia Farmer’s Market and a walk along the Port of Olympia. You can see the state capitol in the background. It was truly an incredible trip. It is beautiful out there when the weather is nice! Glad you had such a nice time. Oh we are so envious...visiting the Pacific Northwest is on our list too. *Pawsome* photo of the PNW! My daughter lives in Oregon and we ❤️ the whole Pacific Northwest area. I've never been there but would love to go one day. The pictures along the coast look amazing and unlike any other coastal area I've been to before. I'm glad you have a wonderful visit! Beautiful! I can visualize sitting on that dock. Yes, very nice over there! Oh, it is sooooo beautifuls!!!! and, yes, Ma is in loves with the PacNorthwest weathers! Haven't been to the Pacific NW in YEARS...it is gorgeous! Enjoy. What a gorgeous photo! I've never been to Olympia, but I am heading to Seattle in a week or so. Can't wait! It looks beautiful there, so glad you had a wonderful visit! That's a picture postcard! Beautiful! Yay!!! I absolutely love that picture! I'm so glad you enjoyed your trip out here! Next time you visit perhaps you can come down to Portland and we'll show you all around! Happy to hear you had a safe and happy visit. I agree, it is VERY beautiful up here in the Pac Northwest..we have yet to be to Olympia, but it is on our "list" of places to visit while we live up here! Wow, this looks so gorgeous! It looks very different from when we went to Seattle, this looks like a beach town. So pretty, thanks for sharing.